This East Tennessee weather is one for the record books. After lounging by the pool all week, then having bitter cold temperatures and rain on Friday, I was hoping for some nice weather this weekend. My wish came half true. I spent the earlier part of Saturday morning snoozing and playing basketball with the kids. Then the rain decided to come, so that meant naptime for me. Thankfully the weather cleared up in the late afternoon because my good friend Taylor hosted a cookout/bonfire at his house to launch the start of summer. The smell of burgers on the grill with a nice breeze blowing was the perfect start to the summer and to the the weekend. Oh how I love weekends! Tonight I am doing a little beach shopping then attending a funeral. And big news: tomorrow I am going to a mixer at a local biking store and am going to ride a road bike for the very first time. Pictures to come for sure! Wish me luck and send your prayers that the crazy drivers on 321 don’t decide to end my fun! 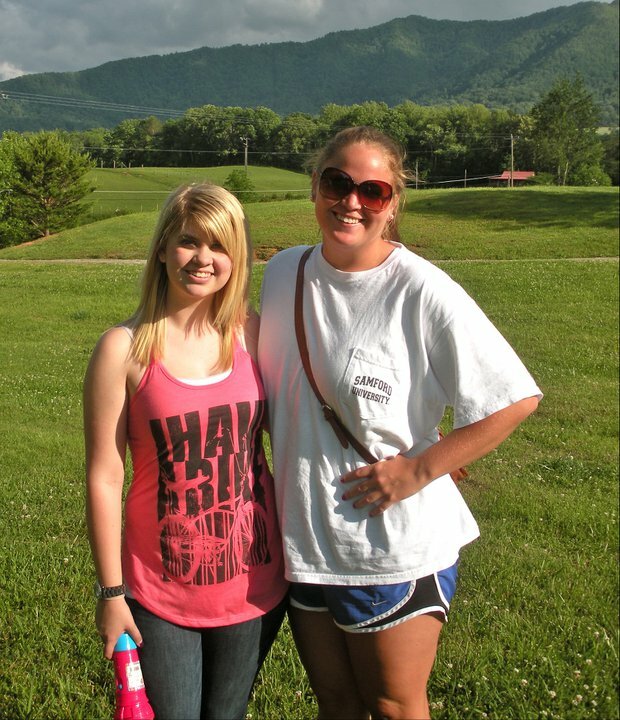 Caitlin and I at the cookout. Be jealous of the mountains; they are my backyard. Ooooh I hope the biking event was fun! I ran on 321 Sat evening… the only weird thing I got was a big ol, "Get it baby!!!" by some random dudes in a truck. Ugh.